My name is Cathrine (Kat) Langwagen and I am a Swedish fantasy artist who specializes in concept art and photo manipulations. I’ve always had a wild imagination and a very visual mind and I express that side in creative outlets such as art and hand crafted items. I have a big interest in creating game art concepts and photo manipulations and the under current in most of my art is nature and a hint of magic and fairytale. If you would like me to do a custom made artwork for you then please don't hesitate to contact me via my websites contact info or via note here in deviantART. Something Ate My Alien on Steam! Something Ate My Alien now live on Steam! We are finally live on the Steam store with the game I've been working on for the last 2,5 years! It would be incredibly helpful if you are a Steam-player and you would check us out and consider adding our game to your wish list. If you have any interest in 2D, hand painted (by myself), retro style, platformer games then "Something Ate My Alien" is definitely for you! I've been working extremely hard on a 2D, digging, puzzle, platformer game for PC with my partner Rob and it is called "Something Ate My Alien" or S.A.M.A. for short. As the only artist in our 2 people team "RoKabium Games" I have done every artwork and design in the game including things such as sprites, UI, player, logo, backgrounds etc. We are very close to public Alpha testing starting, so if you are interested in keeping an eye on our progress and want to know more about this fun new game soon to be released, then head over to our websites and have a look, share, like and so forth. Feel free to join our forums and get involved in helping us with feedback and make sure to subscribe to our newsletter so you don't miss out on updates, news and testing opportunities during development. You can find all relevant info about licencing my images and contact info and links on my profile page here on dA. As most of you already know I offer stock photos to be used by fellow artists and creatives both here on deviantart under my stock name CAStock and from my own stock site www.ca-stock.com . 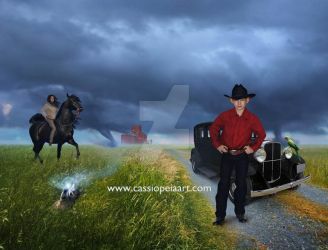 Check out my personal website for my artworks here: www.cassiopeiaart.com . CassiopeiaArt has started a donation pool! Horror movie theme that scares you the most this time of year? 4 deviants said Other, please tell me! A lot of people ask me if they can display my art in their blogs, in articles, on facebook etc online. As long as you DO NOT MODIFY it in any way, shape or form and it is for NON commercial display of my work on online sites and you CLEARLY state that the image belongs to me and you supply a LINK to me then the answer is yes.